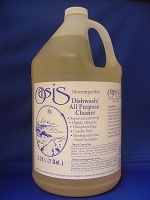 Great for hand dishwashing, general cleaning as well as body soap or shampoo! Best price is by the case of 4 gallons. This item is for Pick Up in Phoenix only we do NOT ship. This is a very hard item to find and ship, primarily because of it's weight. For hand dish-washing, general cleaning and hand soap. Ideal for camping and travel, it can also be used for hand laundry or (at low dilution) body soap or shampoo. The special formula has no sodium salts. Degrades in carbon dioxide, water, nitrogen and silfur. Does not contain phosphate, sodium, chlorine or boron. Breaks down into neutral pH ingredients and will not make soil alkaline. Oasis enables the sustainable reuse of wash water (grey-water) for irrigation. By recycling water and nutrients, natural waters are kept pure. Oasis™ is also suitable for septic tank or sewer disposal. Directions: Super Concentrated so use sparingly. A little goes a long way. Dilute 1:1 for hand dishwashing and hand cleaner. Dilute between 1:5 to 1:10 for use as a body soap or shampoo. Use 1 tablespoon of concentrate per gallon of water for general cleaning and hand laundry.